Professional resume maker, cover letter builder and job search tools! Your resume has a few seconds to capture a recruiter's attention—or your years of hard work and education can be wasted. You need a winning resume whether you're entering the job market for the first time or making a transition in the middle of a successful career. because you were late finding or applying for the position. With Easy Resume Creator Pro, you can find, track and apply for position tasks in seconds, without having to jump through hoops. You can even follow up on the application effectively and efficiently. and cover letter that emphasize your current career level, background, and career objectives. Easy Resume Creator Pro lets you build a resume in the Microsoft Word, HTML, ASCII, and HR-XML formats. finds employment offers posted throughout different job boards, such as Dice, Monster, Monster Canada, Spherion, and many more. You can search for available job openings by keyword, location, career field, and other criteria. An impressive resume that arrives too late is worthless! Easy Resume Creator Pro collects the prospective employer's contact information on-the-fly and helps you apply instantly—right from the search page. With one mouse click, you can send your resume to the recruiter using e-mail, a web form, or an FTP site. correspondence. Every WinResume update sends more styles and samples your way! job boards, federal employment documents, and federal employment-related links. and get rid of the stress in your job searching. Try Easy Resume Creator Pro risk free for 15 days and judge for yourself. Download Easy Resume Creator Pro today. You have nothing to lose and everything to gain. What are you waiting for? Easy Resume Creator Pro version 4.22 is available! Fixed bug with registration customers in Windows Vista Premium Home Edition. Easy Resume Creator Pro version 4.21 is available! Resolved problem with changes the icons in the resume sections taskbar: In the previous version the icons weren't properly restored on the moving section. Easy Resume Creator Pro 4.20 has been released. Updated job search engines, added SSL authorization for SMTP protocol, improved user's interface, fixed some bugs. Easy Resume Creator Pro 4.15 has been released. 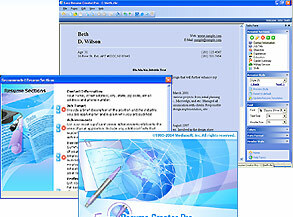 The latest version includes support for the Windows Vista operating system, in addition to many other improved features. Easy Resume Creator Pro 4.12 has been released. Updated free cover letter samples that you can use as a template for developing your personal cover letters. Spell checker includes now a large English dictionary containing over 200000 words. Easy Resume Creator Pro 4.1 has been released. New version includes list of Action Words to describe your experience and accomplishments and spellchecker for English language. Added resume samples, new collection of letter samples, and new job boards like MonsterCanada, MonsterFrance. Officially released Easy Resume Creator Pro with the following functionality: professional resume creation, job board search.